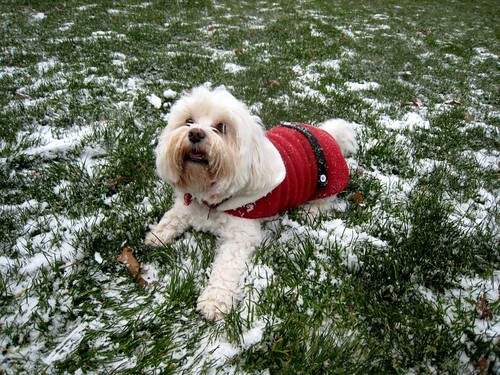 Wink insisted on wearing her Santa coat today. She said she had to since we're getting close to Christmas and it's snowing and all. Note: Don't ever try arguing with a Maltipoo: you'll always lose. So we put on our Santa coat and off we went. Did I ever tell you Wink loves snow? It makes her run. Run like the wind. And it makes her do other things, too. And then she takes off and runs some more. And it makes me laugh every time. To see her so happy and carefree and excited, you can't help but smile. See? You're smiling now, aren't you? I knew it. wink is definitely the 2nd cutest dog in the entire world. 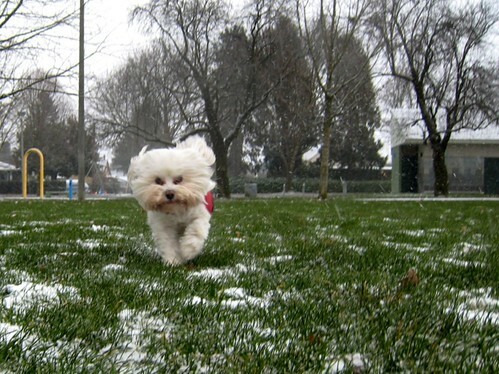 I LOOOOOOVE watching little dogs run at mach speeds!! Same with Mason...he LOVES being outside.. Unfortunately, I don't like it that much.....thankfully, hubby takes him out regularly. They always RUN back to the building. Enough is enough!